"The American Flag should not bear any mark, insignia, letter, word, figure, design, picture, or drawing of any nature." "the use of the flag for advertising purposes." Of course there's always the "fair use clause" for satire or unique (but unaltered) use in events or promotion of events. Use by the President of The United States should technically be strict. 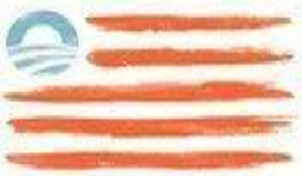 Obama not only endorses his official campaign website but personally approved this artwork for sale. Want To Give Input On Proposed Textbooks?